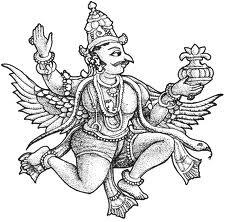 Garuda Panchami is celebrated on the Panchami or fifth day of the Sukla Paksha(waxing phase of the moon) of Shravana Mass(Month). As the name suggest Garuda Panchami is the festival of Lord Garuda popularly known as Garuthmantha, the vehicle of Lord Vishnu. Garuda Panchami is celebrated to commemorate the victory of Garuthmantha on all the Gods in the process of obtaining AMRUTHAM, the holy nectar that gives immortality to the one who drinks it and relieving his mother from slavery. Garuda Panchami is celebrated remembering the difficulties a son undergoes for the well being of his mother. Garuda Panchami is the day of mother and son. On Garuda Panchami, which also popularly known as Naga Panchami, people worship Lord Garuda. The normal process would involve worshipping Lord Garudas image, but a image of the snake lord is also placed and worshipped. The worshipping of snake is to overcome the Naga Dosha that would come as a result of worshipping Lord Garuthmantha.